Bharti Kirchner’s Healthy Cuisine of India is a great introductory cookbook to Indian (or at least Bengali) cuisine. Everything unfamiliar is explained simply, and the recipes are extremely tasty. 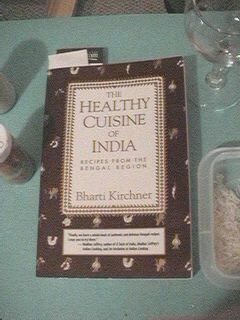 “The Healthy Cuisine of India” is specifically about the cuisine of the Bengal region of India. This, according to author Bharti Kirchner, means an abundance of fish, kalonji seeds, a special Bengali five-spice, and black mustard seeds. The first chapter of recipes is devoted to dal. Dal means legumes: lentils, peas, and beans. The highlights here are “Onion Fragrant Red Lentils” (Musurir Dal) and “Green Split Peas in Zesty Mustard Sauce” (Matar Dal Shorshe Diyea). Chickpeas (Chholar Dal) are common here also and form the base for aromatic and spicy dishes. Vegetarianism is common in Bengal, and the next chapter describes a number of vegetarian recipes. “Spicy Home Fries” (Siddha Alur Bhaja) is a mainstay and easy to prepare. Potatoes and eggplants make up the main part of many of these recipes. “Rich Roasted Eggplant” (Begun Pora), with kalonji seeds, green chili, ginger, onions, and tomatoes, is one of my favorites. Squashes and pumpkins, and then greens fill out the end of the chapter. The next chapter describes many wonderful ways to make rice! From Saak Bhate (greens, chili, and coconut over rice) to lemon-laced rice and shrimp pullao, you can hardly go wrong with any of them. “Ginger-Scented Yogurt Rice” (Doi Bhat), with asafetida powder, ginger, chili, and cilantro is a festival of exotic flavors and one of the simplest to prepare as well. I love it! There is also a chapter on flatbreads, with puffed breads and filled breads. And fish and seafood, with chili-mustard sauce, cashew-pistachio sauce, ginger-raisin sauce. Prawns, shrimp, crab, scallops, clams, and mussels join the fish at your table. Poultry and meat are combined as one chapter. Chicken in rich ginger-poppyseed sauce and beef in rich cashew sauce are the high points of this relatively small chapter. But from there it goes on to the chutneys and raitas. We have mango chutney, tomato chutney, tamarind chutney, coconut chutney and plum chutney, and many more. I find the “Splendid Cilantro Chutney” (Dhane Patar Chatney) to be a splendidly tart way to use up leftover cilantro when recipes call for only a few tablespoons. The final chapters detail drinks, including lassis and teas, as well as ‘teatime’ dishes; and then sweets. “Milk balls” in rose syrup, or in saffron cream sauce. Milk puffs in cardamom syrup. Golden mango cream. Amazingly simple, although I’m not sure how “healthy” some of these are. The final chapter is titled “Dishes for the Adventurous”. These are not unusual by Bengali standards, nor are they particularly strange. They simply use ingredients that are not often found in the West: bitter melon, banana blossom, green papaya, and jackfruit. I’m afraid I haven’t tried any of these, but they do look like they would be worth searching out the ingredients. I found “The Healthy Cuisine of India” to be a great introductory cookbook to Indian (or at least Bengali) cuisine. Everything unfamiliar is explained simply, and the recipes are extremely tasty--though you do have to like chili and spices. I strongly recommend this book for your kitchen. Puree yogurt, water, ice sugar, lime, and salt in a blender until smooth and bubbly and the ice cubes crushed. Pour into chilled glass, sprinkle mutmeg on top, serve. If you enjoy cookbooks, you might also be interested in A Concise Encyclopedia of Gastronomy, Bull Cook Historical Recipes, Cavalier Cooking, Classic Chinese Cuisine, Cooking the Bahamian Way, Country Commune Cooking, Life, Loves, and Meat Loaf, The Art of Korean Cooking, The Casserole Cookbook, The Complete Book of Oriental Cooking, The Complete Bread Cookbook, The Frugal Gourmet Celebrates Christmas, The New Larousse Gastronomique, Saucepans and the Single Girl, The Northwest Cartoon Cookery, Good Food From Mexico, Laurel’s Kitchen, The Cooking of Vienna’s Empire, James Beard’s Fireside Cook Book, French Bistro Cooking, A Fifteenth Century Cookry Boke, Crockery Cookery, Southern Cooking, The Frugal Gourmet Keeps the Feast, The Fannie Farmer Cookbook, French Cooking Simplified With a Food Processor, In Good Taste, Heritage of America Cookbook, Our Favorite Hometown Recipes Vol. II, The Indian Spice Kitchen, Japanese Country Cookbook, La Cuisine Française, Larousse Treasury of Country Cooking, The Natural Foods Cookbook, A Russian Jew Cooks in Peru, Soul Food Cook Book, The Tassajara Trilogy, Pains Spéciaux & Viennoiseries, Whole Earth Cookbook, The Wok: a chinese cook book, Southern Living Cookbook for Two, Lebanese Cuisine, The Art of Syrian Cookery, Popular Greek Recipes, In a Persian Kitchen, The Art of Pennsylvania Dutch Cooking, and The Southern Living Cookbook Library. If you enjoy Indian, you might also be interested in Balti Beef Stew, Dhane patar chatney: cilantro chutney, Doi bhat: ginger-scented rice, and Garam masala. This book, specifically about the cuisine of the Bengal region of India, is a great introductory cookbook to Bengali cuisine. Everything unfamiliar is explained simply, and the recipes are extremely tasty. I strongly recommend this book for your kitchen. The Healthy Cuisine of India last modified May 25th, 2009.